Materials for your most important day deserve the finest paper, the perfect print and the highest care. We offer gorgeous and unique paper options like Bamboo, Cotton and Wood to suit any theme. Experience our high level of detailed service as we strive to provide you with the perfect product for your wedding. Specialty options like Letterpress make for gorgeous premium choices, while quality print on some of our unique stock options offers something beautiful and affordable too. We make designing your wedding prints quick and simple with pre-made design templates that you can customize online - leaving you more time to focus on the other details of your big day. Order Jukebox invitations for your matching RSVPs and Thank-You cards to complete your wedding print package. Our invitation options can also be ordered for any of your important occasions, like anniversaries and formal dinner parties. Make your invitations instantly more glamorous by choosing custom add-ons like foiled edges, rounded corners, foiled or embossed designs or 2-ply combinations. Elegant - 5" x 7"
Design your Wedding invitations today. Order samples so you can find the right invitations. Make your wedding stand out, from the moment you announce it. A romantic take on minimalism, handmade white screen print on gray stock invitations are a perennial favourite that add a unique touch. For a traditional yet modern look, choose gray stock and white ink, or unleash your creativity and opt for other hues that reflect your personality. Request a custom quote for this product today! Make your wedding stand out, from the moment you announce it. These 36pt walnut wooden invitations are produced with a specialty white silkscreen process. The contrast between the walnut paper and white silkscreen complements one another perfectly. The heavy wooden paper is extremely sturdy and the final product is a versatile one that can be the perfect fit for weddings and other special events. These 36pt walnut wooden invitations are produced with a specialty white silkscreen process. You may have seen images of a unique airline ticket shaped invitation on our social media accounts or website. This unique shape (9" x 3.75") is produce by die-cutting, including the perforated sections on the ends. We can offer this shape for your invitations by custom request! Please note that the image above features 3 colour letterpress on our 40pt 100% Cotton stock (this creates the impressed design effect). If you prefer a simpler take on this out-of-the-box invitation, it is also available with standard printing on almost any of our various paper stocks. Please submit a Print Quote request to our Estimations Team for pricing and ordering of invitations in this shape. As for file setup, you may download a blank template here to help aid you in setting up your design. It will be blank and can be used in design software. 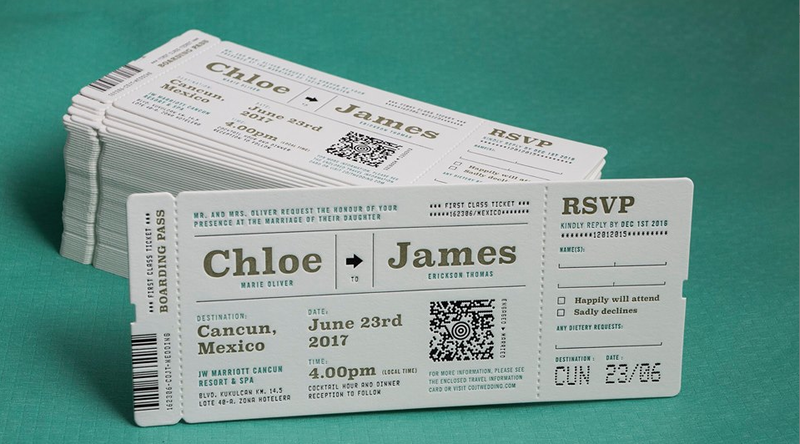 Alternatively, you can create your design using our free Premade Editor: Airline Ticket Wedding Invitation. Can you help me choose the best Wedding Invitation options for me? The options are endless and can be overwhelming. We recommend sitting down and planning out your requirements and budget for the invitations so we can meet all of your needs. If you are looking for something more custom and unique, please place a Print Quote and one of our Print Estimators will be in touch to help you out. See: What should my budget be for Wedding Invitations? Any of our representatives will be able to provide guidance in selecting the perfect Wedding Invitation for your needs. The cost of a set of 50 invitations can be under $60 (based on the most basic product and options). Factors such as stock, print process, coating, special finishes, size and quantity will affect the total cost. Our Design Services for, should you require them, start at $225 for Wedding Invitations. Wedding Invitation pricing varies greatly and can range from $60 to over $800 for a multiple-piece invitation with envelopes and custom options. Your Wedding Invitation Sample Pack is beautiful, can I use one of the designs? The only designs available for use from our Wedding Invitation Sample Pack are ready for download on our Wedding Invitation page. We cannot offer any of the other designs. Can you design my Wedding Invitation? which you can customize with your very own wedding details! Due to a high volume of requests, we are unable to accommodate new Design requests until further notice. However, we welcome you to use our free Wedding Invitation Maker which you can customize with your very own wedding details! Can you label and mail my Wedding Invitations? Can you assemble my Wedding Invitation with ribbon? This is not generally a service we offer. Please inquire via a Print Quote for this service. Do you also print RSVP cards, envelopes and other Wedding stationary pieces? See: Can you do my save-the-date cards? Can you do my save-the-date cards? Save the date cards can be ordered in the same way as Wedding Invitations. Magnets and stickers are also fun and practical to use for save-the-date cards. I DO!.. I mean, we do. We love working with Wedding Planners to make a bride and grooms special day that much more extraordinary. If you are interested in working with us, please get in touch with us! We are not able to provide referrals to a Wedding Planner, but make sure you make it clear you want the best Wedding Invitations – that come from Jukebox. Please call our Customer Service line immediately to have one of our Customer Service Representatives help you out. We can rush Wedding Invitations and have them ready in 1-2 business days (even same day on certain stocks). How long will it take to print my Wedding Invitations? The most basic invitations with standard printing have an estimation of 3-4 business days, while the addition of foils, coloured edging, die-cutting or embossing will add between 2-6 business days depending on the specialty addition you choose. The print turnaround time for your Wedding Invitations will depend on the type and options you choose. How is a 4x6 Flyer different from a 4x6 Wedding Invitation? Flyers are geared towards standard printing and high quantities such as 500+ used for marketing campaigns. Our Wedding Invitations are offered in a much wider range of options and cards and are geared towards the smaller quantities needed for weddings with more premium stock options and formal additions. If you are looking for the most custom and premium invites, we invite you to request a custom Print Quote for your wedding invites with specialty add-ons like foiled edges, silk screen, foil stamped designs or custom shapes. You can also request some of our rare stocks like Bamboo, Wood or Premium Black for your invitations through a Print Quote request. If you are unsure which option to choose, we recommend to order our Wedding Invitation Sample Pack, which showcases examples of a wide range of our finest options. Our Wedding Invitation options offer some of the most luxurious papers. Popular choices include elegant soft Cotton which can be ordered with regular printing, or in ultra thick 40pt with premium letterpress. Boardstock is the thickest paper we carry and has a creamy hue and papery texture, while Brown Kraft is a great choice for rustic wedding themes. 4" x 6"5" x 7"Flight Ticket - 9" x 3.75"